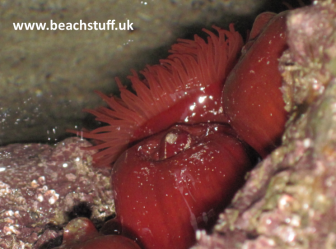 Anemones are blob-like creatures that stick fast to the rocks with their one large foot. 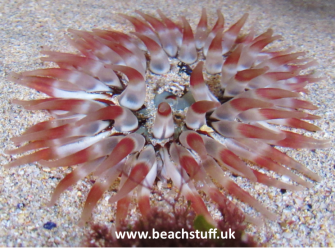 They have tentacles with which to grab pieces of food passing them in the water and a single orifice which serves as both mouth and, putting it politely, the exit hole for the waste their bodies no longer want. 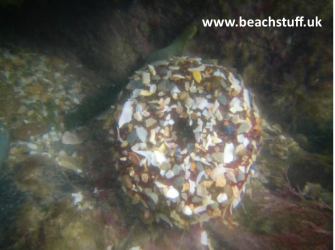 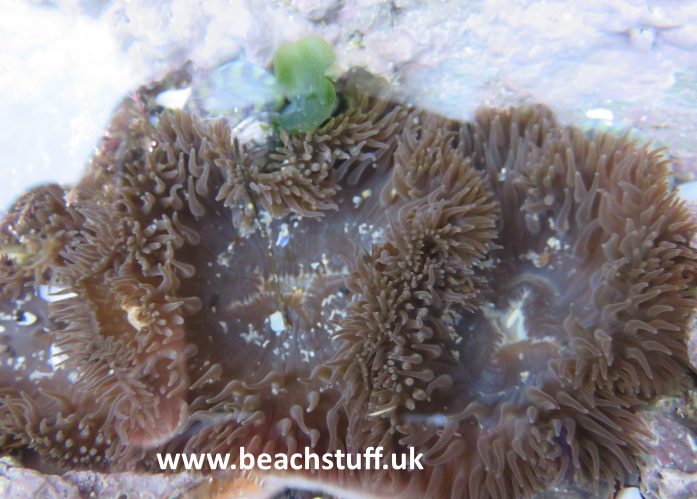 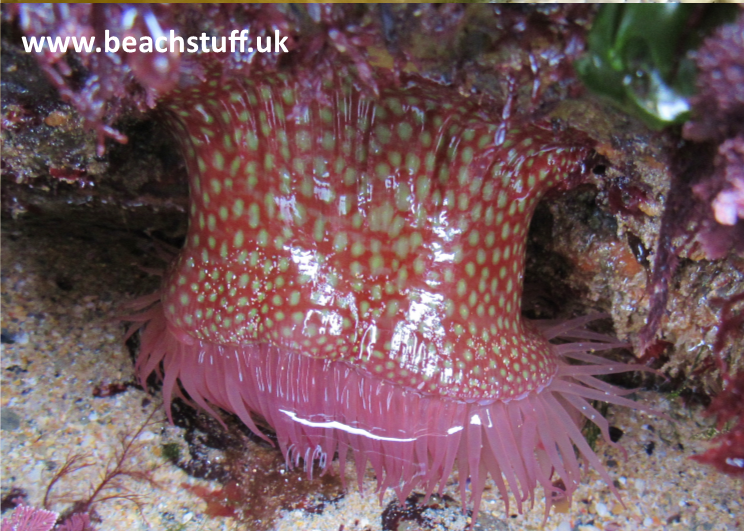 Have a look at the ID of our common anemones below or our gallery of anemone photos on the right. 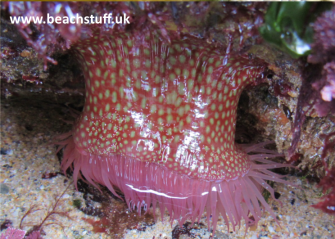 These are generally the most common anemones in our rockpools, the are pictured here both with and without ther tentacles out. 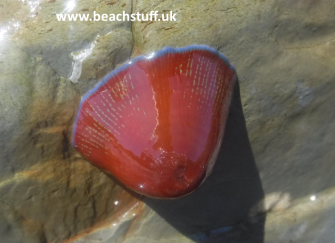 Generally red, they can also be green or brown. 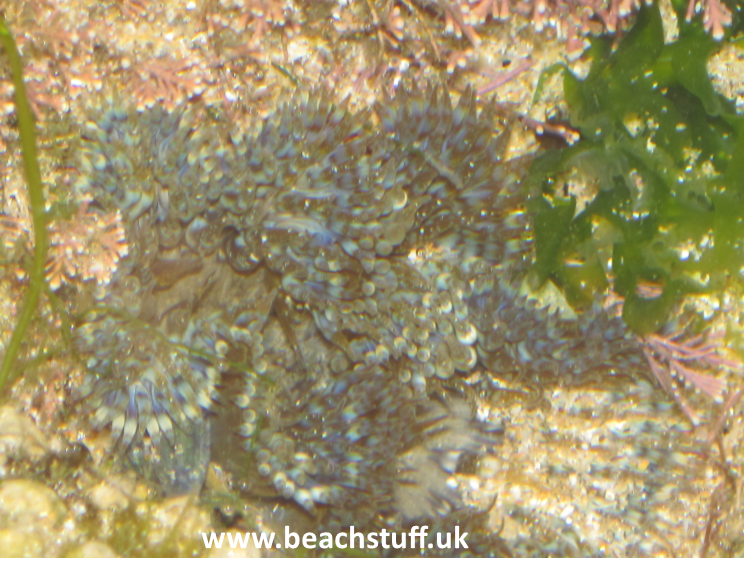 They are often characterised by a blue band around their foot (below left) although it is not always visible. 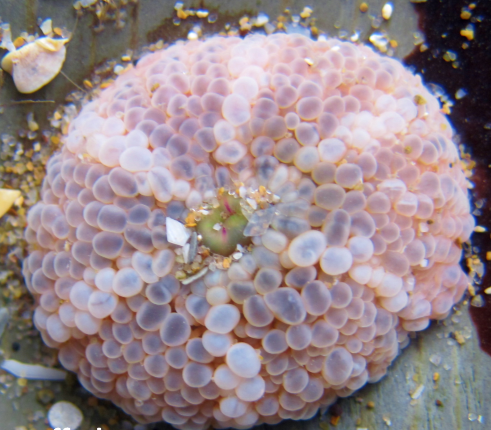 When beadlets fight one another, stinging cells can show at the base of their tentacles (below right). 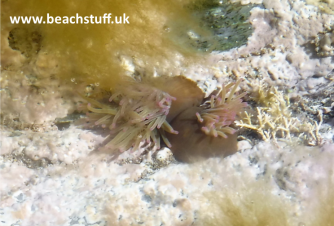 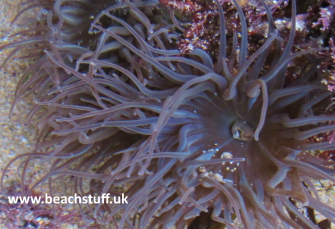 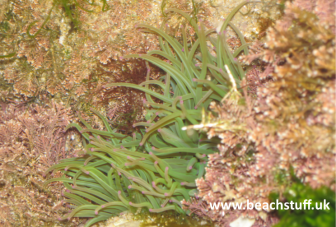 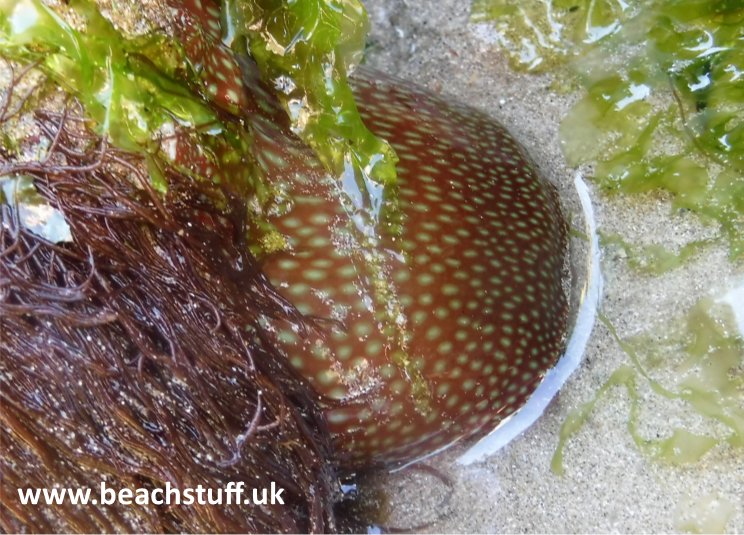 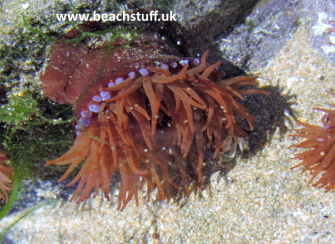 Characterised by long, flowing tentacles which are usually bright green (although watch out for brown - see below - and grey ones(, snakeloc anemones are true beauties of rockpools. 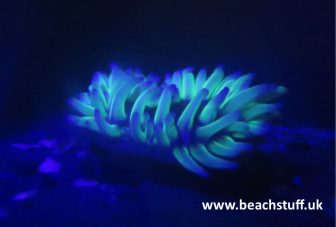 Shine a UV light on them at night, and they will shine right back at you (below left). 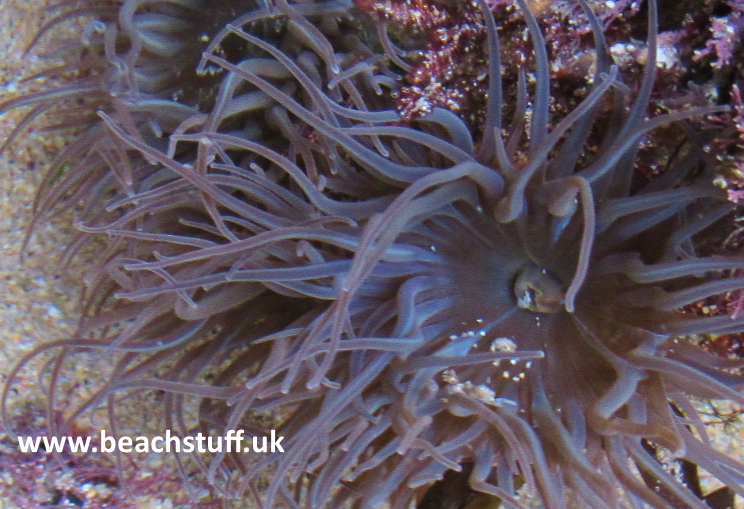 Unlike other anemones, snakelocks rarely fully retract their tentacles. Strawberry anemones are very similar in appearance to beadlets (until recently it was thrrough they were just a variant of the same species) but their skin is speckled to look very much like the seeded skin of a strawberry. 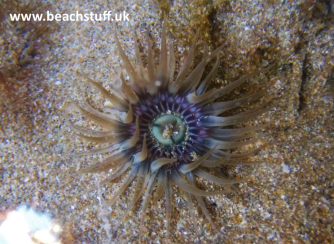 Not the easiest thing to say, but a beautiful anemone. 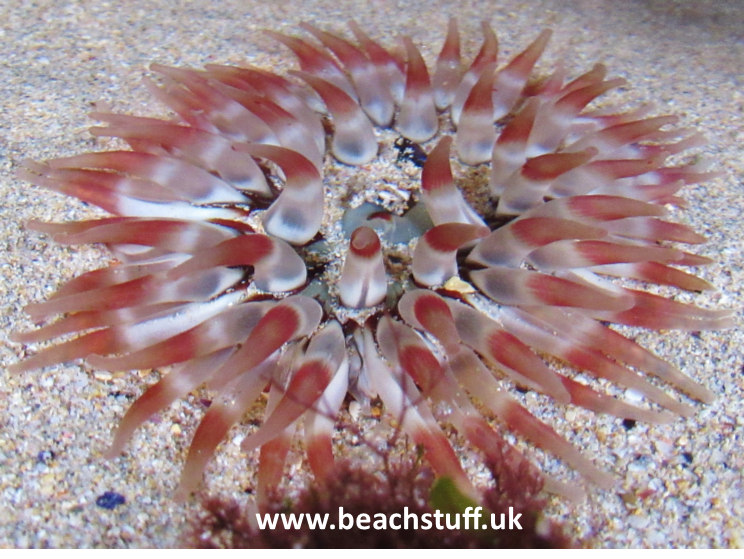 A white star can be seen radiating from its body when its tentacles are tucked in at low tide. 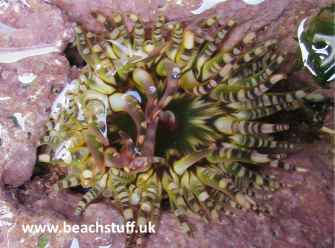 And when the tentacles are out, each one is clearly striped. 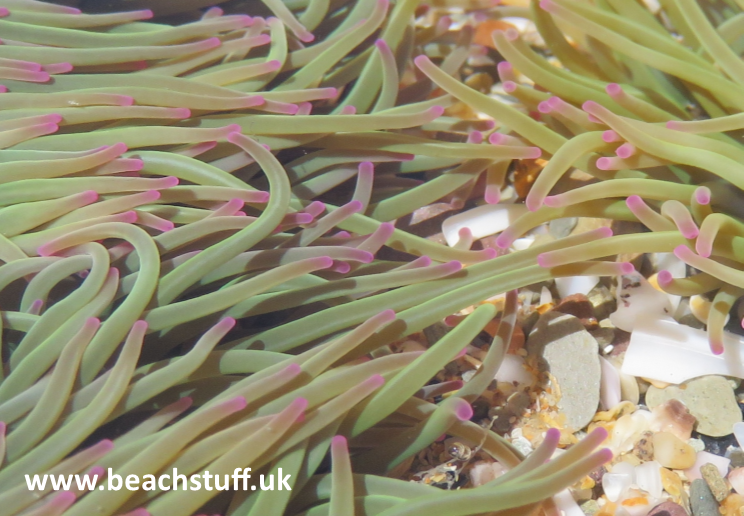 The dahlias are characterised by short fat tentacles which are tipped in a variety of colours including red, pink, purple and orange. The dahlias are often the largest of the sea anemones we see close to the shore, commonly having a diameter of 8cm or more. 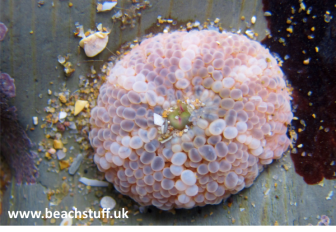 Their bodies are usually covered in bits of shell or stone which serves to make them very difficult to see. 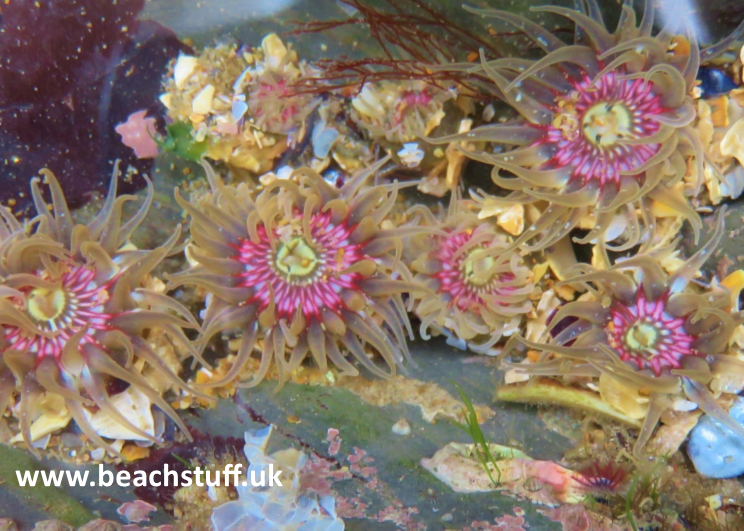 Daisy anemones can be quite parge, typically a few centimetres smaller than the dahlias. 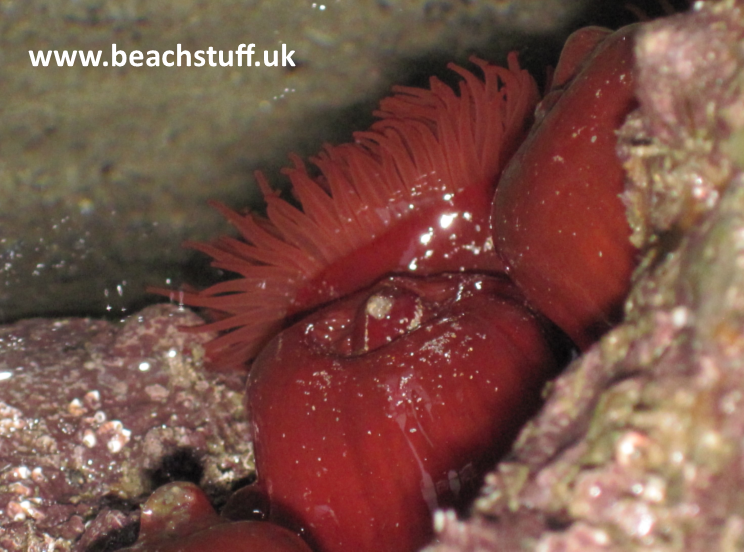 Their tentacles are short and thin and arranged in waves around the outer rim of the anemone's body. These anemones, which can be beautifully brightly coloured tend to like places with a lot of wave action but often bury themselves in sand or stones.